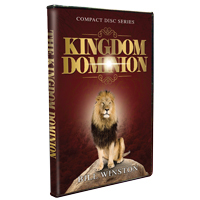 In the series “ Kingdom Dominion” Dr. Bill Winston shows you straight from the Word of God how to take dominion over the earth through Christ. God has placed you in this earth as His Kingdom representatives to reign and rule. Let the revelation shared in this teaching series help you to display all of God’s power and Blessing in your life as you stand tall in faith and take your rightful place through Kingdom Dominion!